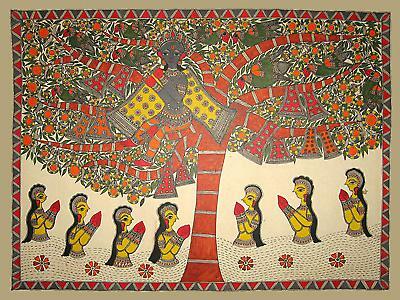 Madhuban, in the Himalayan foothills of Mithila, is the home of the Madhubani paintings. Traditionally, on festive and religious occasions, and during social celebrations, the women of Mithila decorated their homes and courtyards with images that were vibrant, colourful, and deeply religious. The subjects of these paintings were gods and goddesses, mythology and nature. The women use rich earthy colours --- reds, yellows, indigoes, and blues --- in their lyrical paintings of gods and goddesses like Rama-Sita, Krishna-Radha, and Shiva-Gauri. These were intended for shrines and in the khovar, the innermost chamber of the house where the bride and bridegroom began their married lives. The women used basic materials like gum, thread, and matchsticks or fine bamboo slivers wrapped in cotton to execute these wonderfully eloquent paintings.